State-of-the-art dealership inaugurated in Kozhikode (Sundaram Motors of TVS Group as the local partner). Kozhikode, July 22, 2011: After announcing start of sales of the new M&HCV range consisting of MN25, MN31, MN 40 & MN 25 Tipper and winning the Commercial Vehicle of the year award at Apollo CV Commercial Vehicle Award 2011, Mahindra Navistar Automotives Ltd. today inaugurated its new, state-of-the-art dealerships in Kozhikode, M/s. Sundaram Automobiles. Speaking on the occasion, Mr. Nalin Mehta, Managing Director, Mahindra Navistar Automotives Ltd., said “We are now a full range Commercial Vehicle player. We are the leader in LCV market in Kerala with over 50% market share and with our new M&HCVs MN 25, MN 31, MN 40 Tractor Trailer, MN 25 Tipper already plying on roads across India, we have kept the promise that we made during Auto Expo 2010. Our superior product performance coupled with sound value proposition is already helping the customers across India outperform, earn higher profits and get better ROI”. Inaugurating the state of the art dealership earlier in the day, Mr. Mehta said, “This is a moment of pride for us as we look at the changing skyline of the India trucking industry. We have already sold more than 1300 truck across the country within a short span of time, and gained tremendous confidence and appreciation from our customers. We are getting large number of bulk and repeat orders. We have created a world class manufacturing plant in Chakan for trucks with an investment of Rs. 950 Crores and are creating a modern distribution network in the country as the one here in Kozhikode, to cater to the growing needs of the customers. The state-of-the-art dealership will also feature a well-equipped workshop, prompt spare parts availability, mobile service vans and highly trained staff to enable our customers to get a hassle free and delightful experience of owning our trucks”. The company also flagged off the mobile service workshop, yet another first in Indian trucking industry, with the objective of providing ‘anywhere, anytime’, on-road assistance to customers. Coupled with the multi-lingual, 24x7 call centre branded as ‘NOW’, which is manned by trained service experts, Mahindra Navistar is all set to unleash a new paradigm in customer service in Indian trucking. To add to this, nearly 430 Roadside Assistance centres are also in place to provide service. Besides this, MNAL will also draw on the vast pool of M&M auto and tractor channel partners to use as an extended network for servicing customers’ needs. At this stage, 220 such Authorized Service Points are already in place. Within a short span of time Mahindra Navistar has created 751 service touch points across the country and the number is continuously growing. 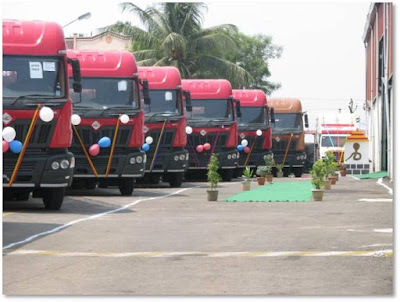 In 2005, Mahindra & Mahindra Ltd. and International Truck and Engine Corporation - the operating company of Navistar - entered into a JV to manufacture light, medium and heavy commercial vehicles for India as well as global markets. The joint venture is in the process of addressing every segment of the commercial vehicle market from 3.5 tonne GVW to 49 tonne GVW with variants of passenger transport, cargo and specialized load applications. The new HCV product range has been engineered to meet Indian requirements with technological expertise from Navistar with the underlying philosophy of ‘Made in India, Made for India and Made with 175 years of international trucking expertise’. The new range of medium and heavy commercial vehicles is being manufactured at a new green field plant at Chakan, near Pune. The plant, which spans over 700 acres, has been set up with investments of over Rs.4000 crores and is producing other M&M products as well. This is helping MNAL leverage the benefits of synergies of an integrated manufacturing facility. Mahindra embarked on its journey in 1945 by assembling the Willys Jeep in India and is now a US $12.5 billion Indian multinational. It employs over 1,19,000 people across the globe and enjoys a leadership position in utility vehicles, tractors and information technology, with a significant and growing presence in financial services, tourism, infrastructure development, trade and logistics. The Mahindra Group today is an embodiment of global excellence and enjoys a strong corporate brand image. Mahindra is the only Indian company among the top tractor brands in the world. It is today a full-range player with a presence in almost every segment of the automobile industry, from two-wheelers to CVs, UVs, SUVs and sedan. Mahindra recently acquired a majority stake in REVA Electric Car Co Ltd. (now called Mahindra REVA), strengthening its position in the Electric Vehicles domain. The Mahindra Group expanded its IT portfolio when Tech Mahindra acquired the leading global business and information technology services company, Satyam Computer Services. The company is now known as Mahindra Satyam. Mahindra is also one of the few Indian companies to receive an A+ GRI checked rating for its first Sustainability Report for the year 2007-08 and has also received the A+ GRI rating for the year 2008- 09.